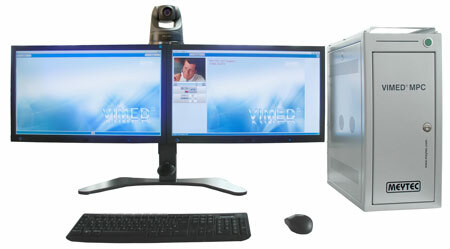 VIMED® DOC BASIC is a more powerful version in comparison with VIMED® BASIC, that is equipped with two TFT-monitors. The physician uses a monitor for the assessment of DICOM data and the other monitor to contact the patient. The contact between doctor and patient is thereby not lost. Even if there are low bandwidths the VIMED® DOC BASIC system provides high quality picture locally. The optional adapted findings monitor enables also the reporting of radiological images. The steerable camera can also show small details. The telemedicine system is normally equipped with VIMED® VOICE audio system.